Moray Towers in Super Smash Bros. Ultimate. 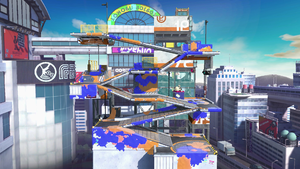 Moray Towers (タチウオパーキング, Beltfish Parking) is a Splatoon series stage in Super Smash Bros. Ultimate. In Ultimate, Inkling is fought here for their unlock battle. Moray Towers has multiple floors to it, each at an angle. When the player runs towards a floor, they go on the downwards floor. The floors also act as soft platforms, allowing for multiple levels of fighting. Judd and Li'l Judd can be seen sleeping in the background of the stage. When a player is KO'd, they will jump into the air. When only one minute remains in a time match or during stock battles, they will hold up victory flags from Splatoon and Splatoon 2, with appropriate coloring for the player/team (red for Player 1, blue for Player 2, etc.) that is in the lead. If two players/teams are in the lead, they will hold up a flag for each one, but if three or more are in the lead, they will not hold up any flags. The stage has two versions: the normal, daytime version, and a Splatfest version which takes place at night. The Splatfest version appears if the music track playing for the match is Ink Me Up, Ebb & Flow, Acid Hues, or Muck Warfare, all of which were Splatfest tracks for either Splatoon or Splatoon 2. Judd and Li'l Judd can be seen dancing during the Splatfest version, rather than sleeping, but otherwise function the same. Right before the match starts, during the on-screen appearances, off-screen Inklings will fire ink at the stage, though this is solely for aesthetic purposes. The ink appears in a randomized pattern of splatters. The set of two ink colors is randomly chosen from various available combinations, with different colors available between the daytime and Splatfest versions of the stage. There are no changes to the stage if hazards are turned off. The Ω form and Battlefield form are suspended in the air with the main platform no longer extending below the blast line. The main platform is a completely flat version of the base of the tower, and it is resized and reshaped to match Final Destination and Battlefield, respectively. The three soft platforms of the Battlefield form resemble the sloping platforms of the regular form. The ink splatters, as well as Judd and Li'l Judd, are still present on the Ω form and Battlefield form, with the same behavior as the regular form. The Splatfest version is also available for these forms, under the same conditions as the regular form. The stage as it appears in Splatoon. Judd and Li'l Judd as the referees of Splatoon 2. Moray Towers is a stage from Splatoon, and was one of only two stages from the original game to be available at launch in Splatoon 2. Like in Smash Bros., the stage has escalating paths for players to cover in ink - one on each side, for each team - with a main area at the bottom for combat. The spawn points are located at the top of the stage, and players have to work their way down if they want to return to the forefront. Unlike the layout in Smash Bros., the paths are not strictly on top of one another, instead forming a valley-like shape. Judd serves as the referee in Splatoon, showing up at the end of matches to determine which team won the match. He is accompanied by Li'l Judd in Splatoon 2. Moray Towers is banned due to the very long vertical zigzag of soft platforms as well as the wall on the corner of the stage being a cave of life. This layout encourages camping and frequent use of anti air moves with characters such as Snake being able to effectively camp below the opponent with little risk. Panorama of Moray Towers' middle floor. Judd and Li'l Judd on the stage. Male and female Inklings on the stage. Diddy Kong trying to swipe a banana from Ness on the stage. Dr. Mario using his Megavitamin on the stage. Joker with his gun on the stage. Lucario using his down tilt on Snake on the stage. Mii Brawler and Pichu on the stage with Judd and Li'l Judd holding up red and blue flags for both fighters at the end of a timed match. The Splatfest version of the stage. The stage seen from above in Splatoon 2. If the timer has reached 30 seconds in a time match, a shortened version of the Splatoon music track "Now or Never!" will play. The version of "Now or Never!" used depends on which song is playing on the stage: regular songs from Splatoon use the original version, "Ink Me Up" uses the Splatfest version, regular songs from Splatoon 2 use that game's version, and Splatfest songs from Splatoon 2 use that game's Splatfest version. This will not occur if "Split & Splat", "Octoweaponry", "I Am Octavio", "Calamari Inkantation", "Deluge Dirge", or any of the four new remixes are playing on the stage. This makes Moray Towers one of five stages in the Smash Bros. series to change music when there is 30 seconds left during a timed match, the others are Mushroom Kingdom (SSB), Mushroom Kingdom (SSBM), Mushroom Kingdom II, and Suzaku Castle (if any type of one of the sixteen character themes from Street Fighter II or Super Street Fighter II is currently playing). In E3 demo version of Ultimate, Star KOs could occur on Moray Towers. In the final game, Star KOs can't occur on this stage. Moray Towers can be seen in the city area of the Light Realm overworld in Super Smash Bros. Ultimate's World of Light mode. Using their neutral special Splattershot, the Inklings are able to lay down ink on the stage's platforms. This only occurs on this stage in its regular form, and doesn't seem to slow down opponents unlike the Splat Roller's ink. At Round 5 of Donkey Kong's Classic Mode route, he'll fight the default Male and Female Inklings at this stage, with "Donkey Kong / Donkey Kong Jr. Medley" playing in the background. This is a reference to the fact that the stage layout for Moray Towers has a striking resemblance to the first stage in the original Donkey Kong arcade game. This page was last edited on April 19, 2019, at 20:31.